As a tribute to the legacy of the Rev. Dr. Martin Luther King Jr. and his fight for poor and working people, members of the Pennsylvania Senate Democratic Caucus are launching a 30-day campaign to address poverty and economic security in the commonwealth. The senators will kick off the Call to Action on the Crisis of Poverty and Economic Insecurity, April 4, which is the 51st anniversary of King’s assassination in Memphis, Tennessee. 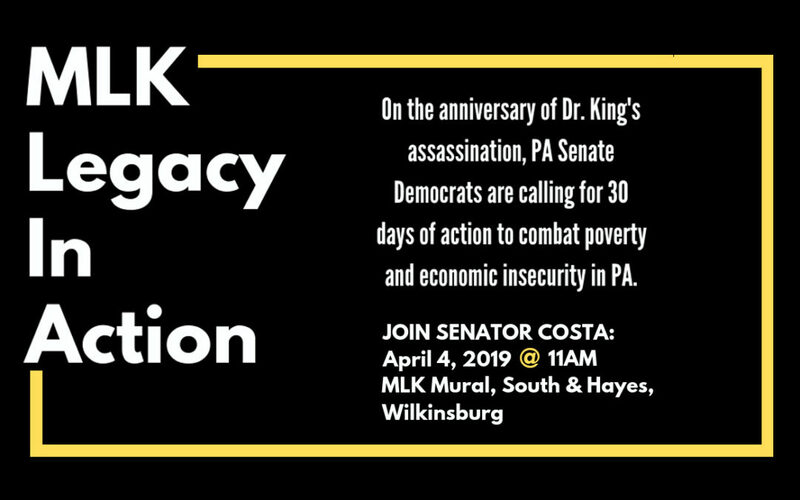 Members of the Senate Democrats will host events in Philadelphia, Pittsburgh, Reading and Scranton announcing the call to action as tribute to King’s fight. Senator Costa will lead the Pittsburgh-area event. The statewide Call to Action on the Crisis of Poverty and Economic Insecurity will to examine 30 issues related to poverty and economic security that the Senate Democrats are working on this legislative session. Each piece of legislation, whether it is a minimum wage increase or better access to affordable childcare, is intended to help improve conditions for Pennsylvania’s impoverished communities. WHERE: South & Hays St. MLK Mural | Wilkinsburg, Pa.
WHO: Senator Jay Costa, Jr.